Optical Fiber Telecommunications VI (A&B) is the sixth in a series that has chronicled the progress in the R&D of lightwave communications since the early 1970s. Written by active authorities from academia and industry, this edition brings a fresh look to many essential topics, including devices, subsystems, systems and networks. A central theme is the enabling of high-bandwidth communications in a cost-effective manner for the development of customer applications. 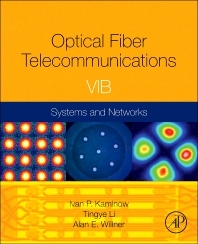 These volumes are an ideal reference for R&D engineers and managers, optical systems implementers, university researchers and students, network operators, and investors. Volume A is devoted to components and subsystems, including photonic integrated circuits, multicore and few-mode fibers, photonic crystals, silicon photonics, signal processing, and optical interconnections. Volume B is devoted to systems and networks, including advanced modulation formats, coherent detection, Tb/s channels, space-division multiplexing, reconfigurable networks, broadband access, undersea cable, satellite communications, and microwave photonics. R&D engineers working on developing next generation optical components; fiber optic systems and network engineers; graduates and academic researchers. "This sixth edition … is not a simple update of this technical field, but it is extending its coverage to include new materials, devices, systems, and applications. It is the next step forward to cover the entire photonics networking technology field that supports our information-based society. I strongly recommend this must-have book to both academic and industrial readers." --Hideo Kuwahara, Fellow, Fujitsu Laboratories Ltd.
Ivan Kaminow retired from Bell Labs in 1996 after a 42-year career. He conducted seminal studies on electrooptic modulators and materials, Raman scattering in ferroelectrics, integrated optics, semiconductor lasers (DBR, ridge-waveguide InGaAsP and multi-frequency), birefringent optical fibers, and WDM networks. Later, he led research on WDM components (EDFAs, AWGs and fiber Fabry-Perot Filters), and on WDM local and wide area networks. He is a member of the National Academy of Engineering and a recipient of the IEEE Edison Medal, OSA Ives Medal, and IEEE Photonics Award. Since 2004, he has been Adjunct Professor of Electrical Engineering at the University of California, Berkeley. Ivan Kaminow retired from Bell Labs in 1996 after a 42-year career. He conducted seminal studies on electrooptic modulators and materials, Raman scattering in ferroelectrics, integrated optics, semiconductor lasers (DBR , ridge-waveguide InGaAsP and multi-frequency), birefringent optical fibers, and WDM networks. Later, he led research on WDM components (EDFAs, AWGs and fiber Fabry-Perot Filters), and on WDM local and wide area networks. He is a member of the National Academy of Engineering and a recipient of the IEEE/OSA John Tyndall, OSA Charles Townes and IEEE/LEOS Quantum Electronics Awards. Since 2004, he has been Adjunct Professor of Electrical Engineering at the University of California, Berkeley. Tingye Li retired from AT&T in 1998 after a 41-year career at Bell Labs and AT&T Labs. His seminal work on laser resonator modes is considered a classic. Since the late 1960s, he and his groups have conducted pioneering studies on lightwave technologies and systems. He led the work on amplified WDM transmission systems and championed their deployment for upgrading network capacity. He is a member of the National Academy of Engineering and a foreign member of the Chinese Academy of Engineering. He is a recipient of the IEEE David Sarnoff Award, IEEE/OSA John Tyndall Award, OSA Ives Medal/Quinn Endowment, AT&T Science and Technology Medal, and IEEE Photonics Award. Alan Willner has worked at AT&T Bell Labs and Bellcore, and he is Professor of Electrical Engineering at the University of Southern California. He received the NSF Presidential Faculty Fellows Award from the White House, Packard Foundation Fellowship, NSF National Young Investigator Award, Fulbright Foundation Senior Scholar, IEEE LEOS Distinguished Lecturer, and USC University-Wide Award for Excellence in Teaching. He is a Fellow of IEEE and OSA, and he has been President of the IEEE LEOS, Editor-in-Chief of the IEEE/OSA J. of Lightwave Technology, Editor-in-Chief of Optics Letters, Co-Chair of the OSA Science & Engineering Council, and General Co-Chair of the Conference on Lasers and Electro-Optics.